I see that Jane Woodlands-Thompson has now got the job as the head of women’s sport at Collingwood, so basically the boss of both the AFLW team and the SSN team. JWT has a not so terrific history with Medhurst and Mentor and I think it highly possible that both these players would not think this was a ‘gain’ for the Magpies club. Not being a fan of JWT and her past issues with some of my favourite players , I am not so pleased about her going to Magpies and this possibly messing with the ‘vibe’ about the place! Positives for this club as far as players, both Kelsey and Mentor (who by the way are loved and will be missed by the sunny coast supporters) will bring a breath of fresh air to the Magpies. They have come from a culture bigger than the individual and if Rob Wright is just as humble and free flowing as Noeline, the team will be right up there. Sad to learn Caitlin was left out… it’s her gain because she is an amazing person – wished she had gone to lightning!!! 2019 will be an interesting year with gains and losses – looking forward to it. Hmmm I didn’t think about that, I’m not so sure how bad her relationship wiht Mentor is but hopeful she can mend her relationship with Medhurst. The Tasmanian Magpies are delighted to announce the appointment of former ANZ Championship Premiership player @ElissaMacleod as Head Coach for the 2019 @Deakin Australian Netball League Season ? I wonder if Lightning was taken off her list, due to Noeline being the SFs coach now? Potentially but she will more than likely have to move now that Nelson is ahead of her. Same with Rainbow, probably the worst club to try and break through at WA. Sure other clubs have a cracker WA starting (ie Vixens) but not two of them in the 10 like Magpies. Such a shame Lambden is still only a training partner. Not surprised to see Gooden return. Very underwhelming at Vixens. Only surprise here is Allan. Netball vic and VIS have bringing her through. Assume it means Vixens have chosen to continue with Newton and Ellis and possibly young Allie Smith. JWT is an incredible speaker. 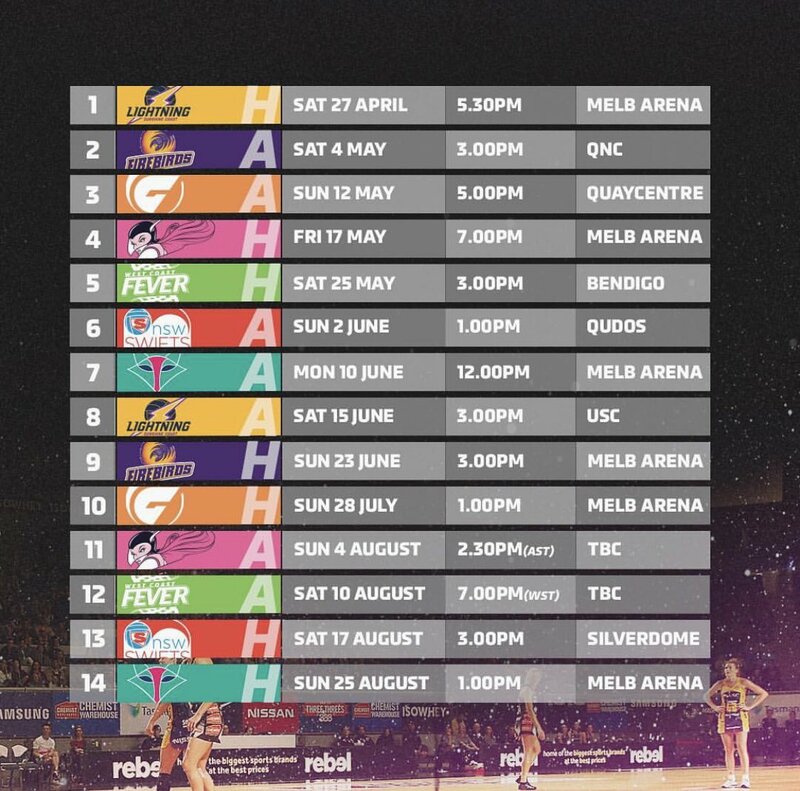 Check out our 2019 @SuperNetball Fixture. We can't wait to get back out on the court ?